Deutsche Post, Europe's largest postal company, is buying a major stake in UK firm Williams Lea as it looks to reduce dependence on its domestic mail market. It will pay 370m euros ($440m;£253m) in cash for an initial holding of 75% in the UK mail and communications company. Williams Lea helps companies exchange printed and electronic information. 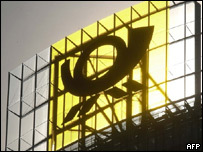 Deutsche Post is expanding, ahead of losing its domestic postal monopoly in 2007. In 2005, it bought UK logistics firm Exel for 5.6bn euros. Deutsche Post said the deal would strengthen its position as a leading one-stop provider of express, logistics and mail services. The deal, expected to be completed this spring, also includes an option to buy the remaining stake in Williams Lea after three years. "Williams Lea gives an excellent platform to make use of chances in the continuing opening up of international postal markets," Deutsche Post board member Hans-Dieter Petram said. Deutsche Post said the purchase would also help augment its DHL Global Mail service. But the German firm said it was not interested in a stake in a European state-owned postal firm such as those in Austria or Belgium.